I have a 30 year old walnut tree that is preventing me from raising tomatoes and other vegetables near this tree. I want to cut the tree down but I do not know if I can get rid of the affect the tree has on the soil because of the roots and the chemical it gives off in the soil near the tree. I want to raise tomatoes and other vegetables that I use to raise in my garden near this tree. What do I do to make the soil good to raise tomatoes and other vegetables that do not grow well near this tree? I was told by one source to apply a product called Roundup to the stump after I cut the tree down, wait six weeks, then have the stump ground up. Is this a good means to solve this problem or is there a better way? Also, how long will it take to eliminate the negative affect that the tree has on the soil near the tree? I would appreciate any advice that you can give me. Once the tree is cut down, most of its adverse effects will be gone in a year or so. 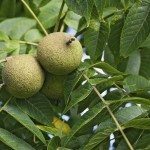 Black walnut leaves and fruit have most of the alleopathic chemicals and since those will not fall (because the tree is gone), it is greatly reduced in the area. The roots do have some alleopathic chemicals, but grinding the stump will not get rid of the roots. 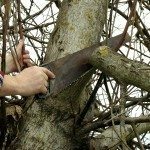 Taking steps to kill the stump for good, by using Roundup or other methods will help to stop the tree roots from producing more, but there is still some there while they decay. A great way around this is to use raised beds in the area. Since the leaves and fruit will not fall on the beds anymore, the soil used in the beds will not have the alleopathic chemicals and the soil will be above where the residual chemicals from the roots still are.